REVIEWS SAY IT ALL! Modern comfort just blocks from downtown Ketchum! This Bridgepont condo is situated in a quiet neighborhood just 5 blocks from the center of Ketchum and 1/4 mile from the Bald Mountain River Run lifts and gondola. It is very close to the Big Wood River trail system that in the summer is used for walking/biking and in winter for cross country skiing or snow shoeing. Ketchum's free Kart bus stops only feet away from this complex taking you to the ski lifts and town on a frequent schedule. The year round hot tub is great after a long day of skiing, hiking or biking! This unit was built in 2000 and is very comfortable and well furnished. It has has two large bedrooms. Both have nearly new mattresses, sheets and pillows. Master bedroom includes mission queen bed, HD television, DVD and Play Station. Master bath has large shower, tub and double sinks. Guest bedroom has unique queen over queen log bunks. Guest bath has large shower and tub. Plush towels in both. Fully equipped modern kitchen. Pine floors. High ceilings. Living room has two sofas, oversize chair, ample lighting and a gas-ignited river rock fireplace, new 48 inch HD television with DVD player. Large windows boast views to the east, west and north including Sun Valley's own Bald Mountain. Small private deck and fenced yard include chairs and BBQ. Our condo has been meticulously cared for, kept tidy and clean and is much more comfortable and modern than most two bedroom units. Please feel free to contact us any time with your questions or comments. Secure high speed WIFI included. We live in Twin Falls, Idaho, just an 1.5 hours south of the condo. By living nearby we are able to keep a close eye on the property and to meet virtually all the basic needs of our guests. You won't find a more comfortable, more convenient or better equipped two-bedroom, ground floor condo. Convenient parking too. 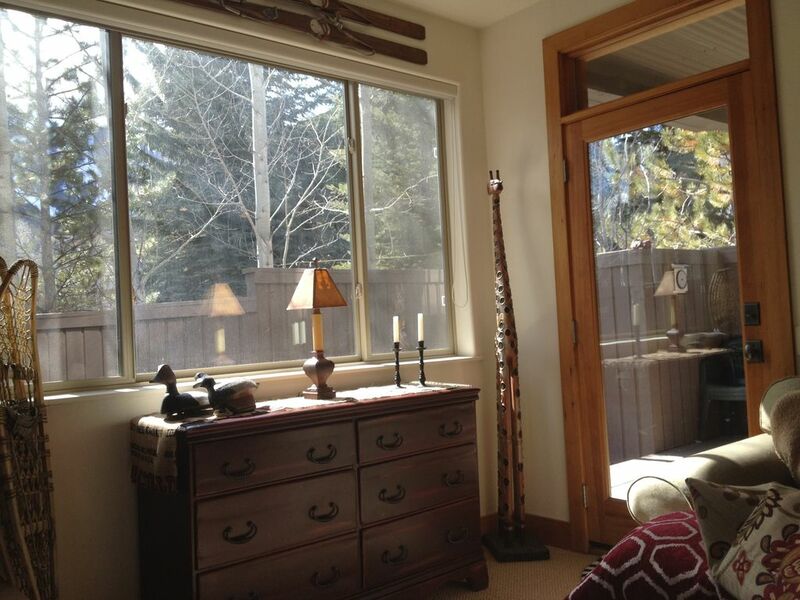 Condo is just a few minute walk from either downtown Ketchum or River Run lifts. Bus stop across the street if you don't feel like walking. Two fully equipped full bathrooms. Two sinks in master. Both have tub and shower and plush towels. Convenient, same level as condo. Two sofas, over sized chair, and beautiful rustic furnishings including french coffee table. Gas cook top, electric oven. Fully equipped. Includes all flatware, pots and pans, spices, coffee maker, bowls, and serving trays for every occasion. Also includes 3 bar stools at breakfast bar. Check reviews. We make every effort to ensure our guests comfort. Condo is very clean and modern with wonderful light and views. End unit allows windows on three sides and limited interface with neighbors. Appropriately decorated. Very comfortable home with excellent access to town and mountain. Downtown Ketchum is a 10 min walk and the shuttle to the mountain, which comes every 30 min, is about 150 feet away and 2 stops. Door to mountain is less than 5 min. The home itself is very comfortable for a family of four. Nicely futnished, very clean, well apointed and good location. I would echo all the previous positive comments. Great condo with a good location - just not the great location as map suggests. Had a windy and cold walk home from dinnner a few nights! Great property in excellent location! Was in Ketchum for a bicycling event, with family. The event started and finished in downtown Ketchum, and the property is a nice walk from downtown. It's also easy to get to a park and a ski hill, that has trails for hiking and trail running. The property has two bathrooms for the two bedrooms, and a comfortable living room adjacent to the dining area and kitchen. There is a nice little patio outside, that was a great place to relax on unusually hot afternoons. Everything was in working order. Recommended. No Pets. No Smoking. Rates subject to change until reservation confirmed.